Welcome to the Comic-O-Matic Developer’s Blog! I’ve started this blog to help keep folks apprised of what I’m working on to make Comic-O-Matic (http://www.comicomatic.com) better! I’ll post suggestions and requests here that I get via email and FB, and let everyone know what I’m doing behind the scenes! Comic-O-Matic is a random 3-panel comic strip generator, giving the user two random cartoon characters with random expressions in each of three panels. You write the dialog. If you don’t like a character or an expression, uncheck the part and make a new strip: Comic-O-Matic will give you a new random choice! 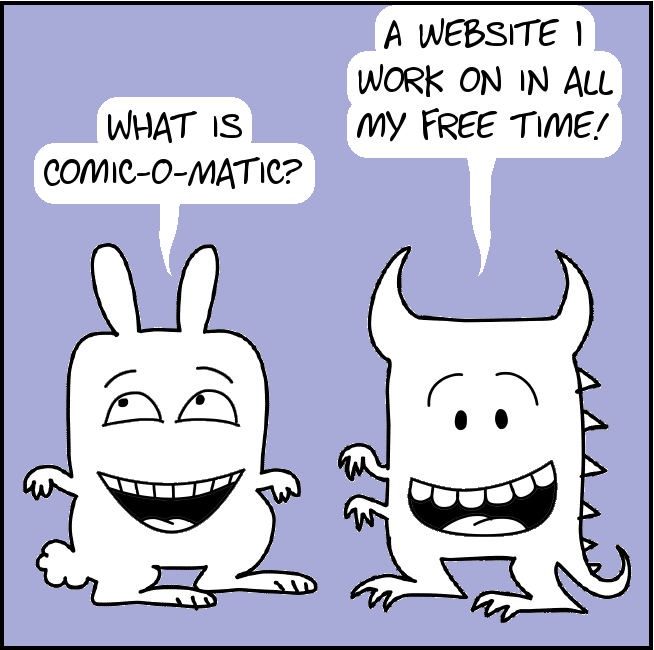 I started making Comic-O-Matic on May 9, 2011. It is still very much in development, so I want to hear how people are using the basic features I developed – what you like, what you wish it would do, what strange things you’ve noticed (and whether you like them or not! ), etc. I am working on this all the time, and really enjoy hearing feedback, and seeing what I can do! If you have been making comics of your own, please consider sharing them at the Comic-O-Matic Facebook page and/or the Freecomicnomics blog!